As I indicated in my last blog, I’ve decided to join the ranks of the reloaders and start making my own ammo. Since I’m starting from scratch, that means shopping for the equipment that I’ll need to get started. I’ve done a lot of research to learn which of the many options will work best for a beginner like me. 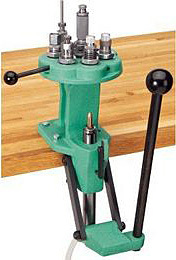 Single-stage — A single-stage press, like the RCBS Rock Chucker Supreme shown here, holds only one ammo case and one die at a time. Dies do the work of removing (decapping) the old primer from the case, installing a new one, resizing and shaping the case, and seating and crimping the bullet. To make handgun ammo, most reloaders use three or four dies to complete the process. With a single-stage press, since it only uses one die at a time, you would batch process your ammo; that is, you would load the first die on each case, change dies and run each case through the press to complete the second die’s function, and so on, until you complete the final stage of crimping the bullet in your cartridge. You have to pull the handle on your press four times for every round that you manufacture. Because they only do one function at a time to only one cartridge, single-stage presses are inherently slow, but they give you the highest degree of control over the reloading process. They have traditionally been the recommended entry point for new reloaders because a single-stage press gives a beginner the opportunity to closely observe and understand what is happening with the ammo manufacturing process every step of the way. Besides beginners, single-stage presses are also a good choice for those who mainly reload rifle ammo, especially hunters. They don’t blow through as many rounds as handgunners do, so they don’t require a high output reloading press. For them, it’s more about quality than quantity of ammo. They have the luxury of taking their time to craft a small number of highly accurate rounds. Single-stage presses are also the best option for those on a low budget, with some models starting at around $100. Turret — The next type of press is a turret press. It also works with only one round of ammo at a time, but it can have multiple dies installed, which eliminates the need to switch and reconfigure dies after each stage of the reloading process. You can do all of the stages of reloading a cartridge without removing the cartridge until it’s finished. Place the cartridge in the press and pull the handle to perform the function of the first die. To do the next step, rotate the turret to move the second die into position, then pull the handle again. Repeat the process with all of the dies until you have a completed round of ammo. You still have to pull the handle four times for every round, but you don’t have to swap out every round of ammo multiple times, and you don’t have to install and configure each die repeatedly when you move from one stage to the next. Set it and forget it. Some turret presses accommodate as few as three dies, while others, such as the Redding T-7 shown here , can have as many as seven installed at once. With a seven-hole turret, you can have the dies for two different calibers installed and ready to go. This can be a real time saver if you typically reload two particular calibers. Skilled turret press operators can turn out up to 200 rounds of handgun ammo per hour. And you always have the option of batch processing your ammo (doing the first step on all of your rounds, then doing the second step on each of the rounds, etc.) and running your turret like a single-stage press if you so desire. 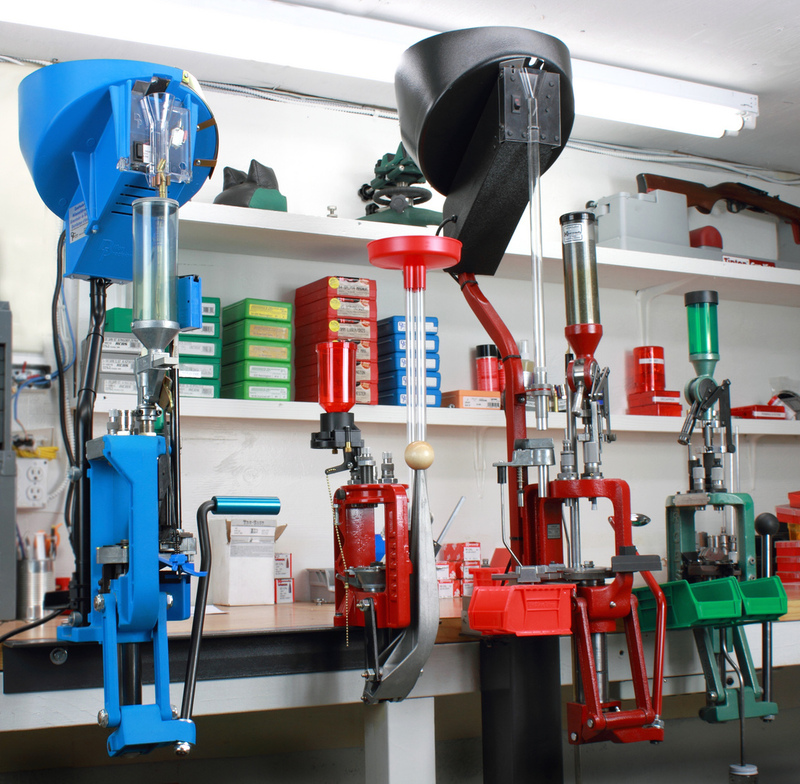 Progressive — Progressive ammo presses are the real production machines of the reloading world. Instead of working with just one round of ammo at a time, progressive presses work with four or five cartridges simultaneously. Set a case on the shell plate in the press and pull the handle for it to work with the first die. The shell plate is then rotated for you to insert the next case onto it. If the press has the capability to automatically rotate the shell plate from one stage to the next (and most progressives do), it’s called “auto-indexing.” Pulling the handle engages the newly placed case with the first die and the first case that you placed with the second die. As you continue to pull the handle and add cases, you soon have a cartridge in every position on the shell plate and every pull of the handle performs engages all of the cases with the dies above them, so you’re working with four of five rounds of ammo simultaneously. When a cartridge has made it through all the stages and is complete, it gets dumped out into a storage bin to make room for a new case to be inserted. After the first four or five pulls of the handle to get the shell plate fully loaded, you’re spitting out a completed round with each subsequent pull of the handle. 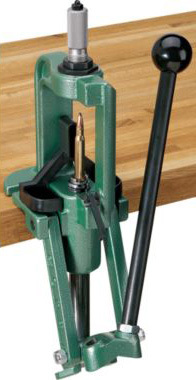 Completing a round of ammo with each pull of the handle makes a progressive reloading press a real speed demon. Optional attachments are available for most progressive presses that will automate the process of placing a case on the shell plate and placing a bullet on the mouth of the case just before seating it in the brass. Many reloaders say that they can turn out 500 rounds per hour with one of these tricked-out machines. That makes them ideal for high-volume handgun shooters or for anyone who has more money than time. But because they perform every stage of the reloading process to a different cartridge at the same time, they generally aren’t recommended for first-time reloading users. Obviously, a progress press is much more complex mechanically and can require some troubleshooting and tinkering to keep it running properly. If you are “mechanically challenged” a progressive might not be your best option. So as with most things in life, there’s different strokes for different folks. You may want to jump right to a progressive, but it will cost a lot more than a single-stage or a turret, especially if you get add an automatic case feeder and bullet feeder. Changing calibers on some progressives can be expensive and complicated, too. But if you’ve got the money, need a high-volume manufacturing capacity, have a decent amount of mechanical aptitude, and are a skilled multi-tasker, why not go for it? If that doesn’t describe you, a single-stage or turret press is a better entry point. In my next blog I’ll reveal which press I’ve decided to start with and why.